But you hate blogs, you say. No, you don’t. You love information. In fact, you’re reading a business blog post right now. You probably just don’t like what “blogging” connotes, which is the image of a rambling narcissist with a chocolate martini in one hand who’s going on and on about significant others, coupons, and what they ate for lunch. The blog attention span lasts for 450 to 650 words. Go over 650 words and you’re going to lose your blog readers. Most people who read posts are taking a short break to research a topic and learn something new, then they’re getting back to work. Not only is this length enough to effectively cover a simple idea, it’s also easy to write. If you have a more in-depth subject, cover one idea per blog and link the posts (more on that below). You don’t have a lot of words to work with. So, throw a photo, graphic, or picture in there. It’s worth a thousand words. Also, readers expect some art with their posts. Then, visually break up your text into bite-sized chunks or bullet points to make it easy for readers to scan. If you don’t conform to the typical look of the blog, you’ll lose readers right off the bat. Trust me on this. You think since you have an audience’s attention that you need to pitch them. Always be closing, right? Not in your blog though. This is a safe place where you get to just talk and be the wise, insightful expert that you are. People who read blogs are information seekers. 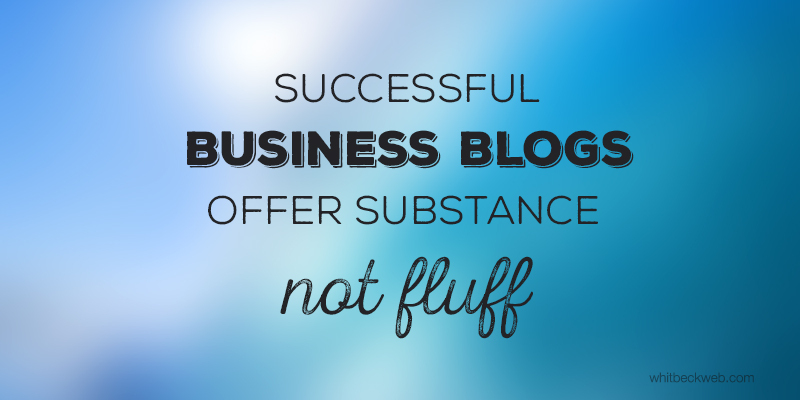 If you sell to business blog readers, you break the contract. So, give them what they want—substance. If you don’t promote your posts, who will? You could be the best writer in the world, but if you don’t put yourself out there, no one will ever know. Your stunning ideas, revelations, and stories that capture the imagination will go unread. So, reach out with social media, email, and any other tools you have to engage with your audience. Then be consistent with your posts. A prolonged silence will cost you loyal readers. Include at least one link to your own writing to give your reader more information. Let’s face it, sometimes we’re not done taking a quick break after 450 words. Maximize your audience by linking them to something else to read … or they’re gone. A link at the top of the post and one toward the bottom will cater to both the reader who isn’t interested in your post from the start and the reader who wants more from you at the end. So, get writing and promoting your short, informative posts that have visual appeal and internal links. Let your writing evolve, and keep reading other business blogs like this one for tips and advice. It won’t happen immediately, but if you keep it up, you might just build an audience of loyal followers who respect your hard work and expertise. Now I suppose your going to tell us these same laws allow destruction of private property, harrasment, beatings and muggings. I have personally seen union members do such things while demanding my support for their cause.